Winter is truly upon us now… BRRR! In this month’s blog we’ll look at how Toby has bounced back from his rough summer and how hard it is getting back into the swing of training after such a long break. We’ll also look at what western discipline we’re going to work towards and show you some of the “obstacles” we’ll be facing in our Learn More section. Finally, Toby and I have reached the light at the end of a long and windy tunnel! We beat Sweet Itch and Laminitis! It was tough, probably more for me than Toby. There is nothing worse than seeing your horse suffer and having no idea how to stop it! 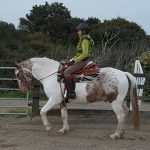 The laminitis was tough, but we had a plan, and we instantly saw results. The Sweet Itch however was tougher. No matter what I did, there never seemed to be any improvement. When it looked like we’d cracked it, he’d get another flare up. In the end, all I could do was make him as comfortable as possible and just wait for the end of the Sweet Itch season. It was hard work, but we’ve got through it and next year I will be prepared for it. Toby is now back to his normal routine. He’s in during the day and out in his paddock at night. He much prefers this. His weight has stabilized and although he does have a little pot-belly, I’m hoping with his work load starting to build up more, and winter around the corner, he’ll drop it off in no time. Plus, I am planning on moving him off straw and back onto woodchip or wood pellets. He has a tendency to snack on straw! As every horse owner knows, knowing when to put a rug on a horse or not is the big million-dollar question. I’ve seen this year the rug question has been a lot more prominent on social media. It seems more and more people are discussing and researching the effects rugs have on our horses. I’ve been lucky in that Toby is quite a naturally hot horse and doesn’t feel the cold too much. I’ve decided this winter I am going to be stricter with his rugs. He currently isn’t clipped, and I hope I shouldn’t need to clip much off him. After losing a lot of his coat during the Sweet Itch season and areas on him becoming damaged with the rubbing, I really noticed how little he molted this year. This was one reason why I didn’t want to clip him, I wanted his coat and skin to fully recover. I have decided this winter he will not have any turnout rugs with neck covers on (unless we get snow like we did last winter!). I want him to use his natural internal thermostat to help keep himself warm. This in turn will help him lose a bit more weight and come into the new Spring a little leaner and less likely to have another bout of Laminitis. I have spoken with my vet about this new rug routine and they are happy for me to do it. I will of course monitor his weight (and warmth) on a regular basis, to insure he is happy and comfortable. Anyone thinking of doing the same should speak with their vet first. I thought I would show you some of the obstacles that often come up in a Trail pattern at shows. We are beginning to learn the first steps into Trail work, and how different movements will help us tackle these. When trail riding, the ability to open and close a trail gate without dismounting is a valuable skill. Staying mounted on your horse is safer, faster, and more efficient than dismounting and leading him through. Teaching your horse to respond to your precise cues will reinforce your leadership role in your herd of two. 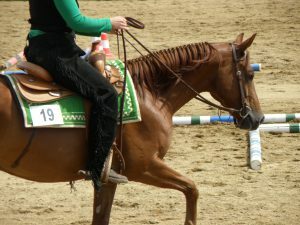 placement when the horse walks, jogs or lopes over the poles, and has points deducted when they touch a pole. They can be on the floor or raised. Not only do you ride over them like you would normally, they can also be placed like “corridors” and riders ride their horses in between them, forwards and backwards and can also side-pass across a pole. Similar to the poles, this obstacle is a different surface for your horse to walk over. Not only that but is also above ground level. Some bridges maybe be a slope up and down, and others will be a step and down. Either way, it’s about showing the judge the skill and obedience between horse and rider, and the confidence your horse has in you.